Celebrating their final year as Europeans, island-monkeys Becca and Louise got invited to the 2018 European Capital of Culture in Malta, having missed out on Hull last year. They went to drink rum with Brits abroad but found a lot more than they expected. Lads on tour Sh!t Theatre want to talk about home, your home, what we are doing in your home, what you might be doing in our home and how cheap the beers are. From our small island in the sea to another small island in the sea, Sh!t Theatre found mystery and murder in the fight to be European. 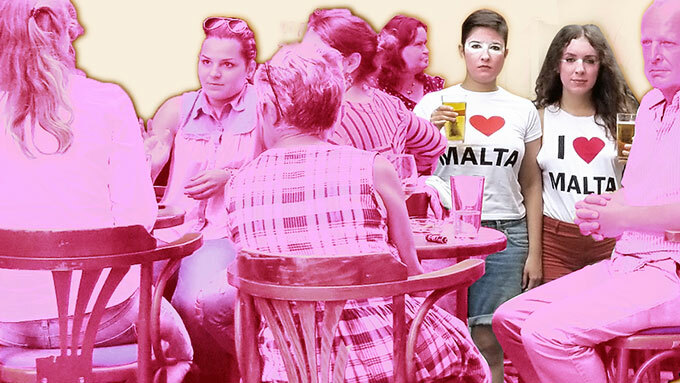 Finally the first-preview of that experimental fringe theatre show about Malta that you’ve all been waiting for! This produciton is supported by: Arts Council England, ARC Stockton, Bush Theatre, Jacksons Lane, Live Art Bistro, Theatre Royal Portsmouth, Camden People's Theatre. Sh!t Theatre are Rebecca Biscuit and Louise Mothersole. They were winners of the Total Theatre Award 2013 for Best Emerging Company, an Arches Brick Award 2013 for their show JSA (Job Seekers Anonymous) 2013, and were shortlisted for the Amnesty International Freedom of Expression Award 2014 for their show Guinea Pigs on Trial. Their sold-out 2015 award-winning show Women's Hour was one of the Telegraph's Best Five Plays to see in Edinburgh. Letters to Windsor House won a Fringe First in 2016 and has been published by Oberon Books, along with their current show DollyWould. DollyWould was one of the Guardian Top 10 Picks Ed Fringe 2018, won a Brighton Touring Award, and has just finished a two-year tour with shows in Australia.